With the back-to-school shopping complete and the kids back in school, why not treat yourself to some goodies? 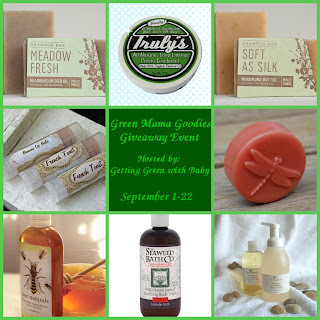 Today marks the first day of the Green Mama Goodies giveaway! I’d like to give a big thank you to all of the great sponsors for making this giveaway possible, my lovely co-host at FaithFilled Footsteps, and all the wonderful promoting bloggers! All week long GettingGreen with Baby has been bringing readers reviews of great, natural bath and body products geared towards mom. If you would like to read the reviews, please follow the links below. -12 oz. Bottle of Wildly Natural Seaweed Body Wash in Lavender from The Seaweed Bath Co.
One lucky reader will win the entire package listed above! For your chance to win, please enter the Giveaway Tools form below! Only your e-mail address is mandatory (to contact you if you win), but keep in mind that the more times you enter, the better your chances are of winning! Good luck! Getting Green with Baby nor any of the promoting blogs were compensated monetarily for participation in this giveaway. Furthermore, they are also not responsible for prize shipment: that belongs to the sponsors. (Excluding Bee Naturals.) This giveaway is not associated with Facebook, Pinterest, or Twitter. All opinions expressed here are original and may differ from your own. If you have any questions or concerns about this giveaway, please contact Alicia at Getting Green with Baby at Alicia Owen 6814 at yahoo dot com. I've learned it contains powdered sugar! Wow, I've looked at lots of recipes for organic deodorant and I've never seen that before. Very interesting; would love to try. I love Truly's and have been using it for months. The ingredients are definitely unique.